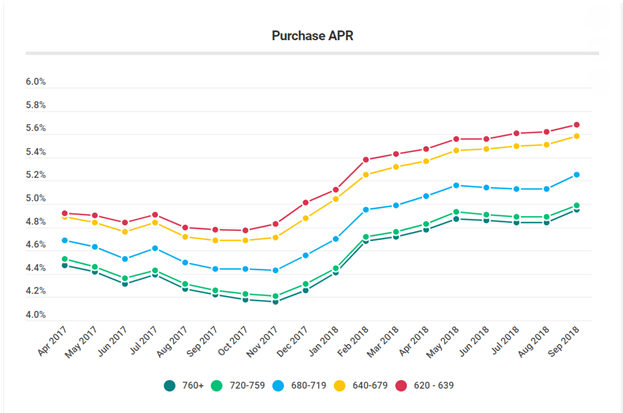 September’s best offers for borrowers with the best profiles (the 95th percentile of borrowers) had an average APR of 4.39% for conforming 30-year fixed purchase loans, up from 4.32% in August. Refinance loan offers were up 5 basis points (bps), to 4.40%. We consider people with the best credit profiles to be those who received the best mortgage offers through the LendingTree marketplace, which allows users to compare offers from multiple mortgage lenders. Mortgage rates vary depending upon parameters including credit score, loan-to-value ratio, income and property type. 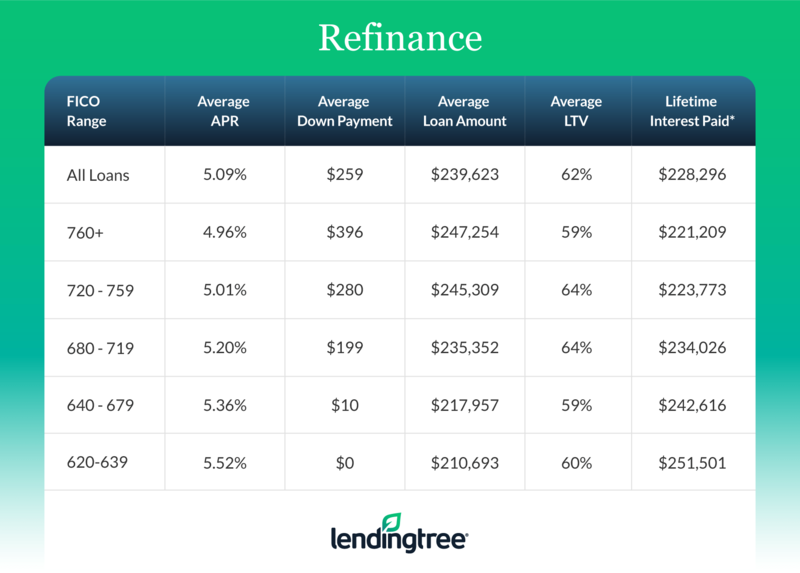 For the average borrower, purchase APRs for conforming 30-year fixed-rate loans offered on LendingTree’s platform were 5.09%. Up 10 bps from August. The loan note rate of 4.96% is the highest rate of the year. We prefer to emphasize the APR, as lenders often make changes to other fees in response to changing interest rates. Consumers with the highest credit scores (760+, representing the 65th percentile of borrowers) received APRs of 4.95%, versus 5.25% for consumers with scores of 680 to 719. The APR spread of 30 bps between these score ranges increased 1 bp from August. For the average purchase loan amount of $231,175, the spread represents over $15,000 in additional costs for borrowers with lower credit scores over 30 years. The additional costs are due to higher interest rates, larger fees or a combination of the two. For the average borrower, refinance APRs for conforming 30-year fixed loans were up 11 bps from August to 5.09%. The credit score bracket spread widened by 1 bp, to 24 bps, amounting to nearly $13,000 in extra costs over the life of the loan for borrowers with lower credit scores, given an average refinance loan of $239,623. Average proposed purchase down payments were down about $150, to $56,786. *Lifetime interest paid is calculated based on the overall average loan amount to enable comparison. The LendingTree Mortgage Offers Report contains data from actual loan terms offered to borrowers on LendingTree.com by lenders. We believe it is an important addition to standard industry surveys and reports on mortgage rates. Most quoted industry rates are for a hypothetical borrower with prime credit who makes a 20% down payment. Most borrowers do not fit this profile. Our report includes the average quoted APR by credit score, together with the average down payment and other metrics described below. We stratify by credit score, so borrowers have added information on how their credit profile affects their loan prospects. The report covers conforming 30-yr fixed loans for both purchase and refinance. Down Payment: Though analogous to the LTV, we find that borrowers identify more closely with the down payment. Academic studies have also found that the down payment is the primary concern for homebuyers and one of the main impediments to entering the home buying market. Lifetime Interest Paid: This is the total cost a borrower incurs for the loan, inclusive of fees.